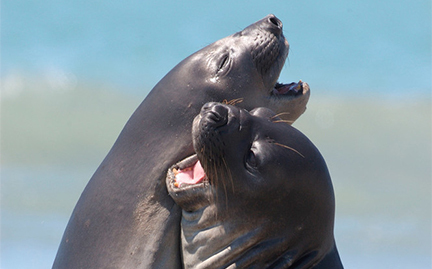 Elephant seals come ashore twice a year for breeding and molting, and while on land, they take no food or water. Fasting is part of their life cycle. Males fast for up to three months on the beach during the breeding season while guarding a harem of females. Females, tending their pups, fast onshore for about a month while they are nursing. During the breeding season, they experience dramatic weight loss, sometimes nearly half their mass.